The Safety Centre have now added a Chrome Fire Extinguisher range to their product portfolio. This range of Chrome Fire Extinguishers are manufactured by Thomas Glover. Thomas Glover are a well respected name within the Fire Extinguisher trade for producing a high quality, good value product. The Chrome Fire Extinguishers in the range are all BSI Kitemarked, CE Marked, BS EN3 & MED Approved. This gives 3rd party approvals to show that these Chrome Fire Extinguisher meet the required standards for use within the UK. Along with the units themselves The Safety Centre can also supply a range of accessories to accompany the Chrome Fire Extinguisher range. 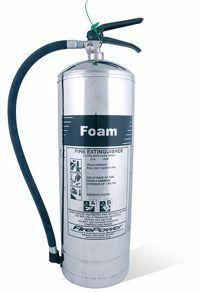 These accessories include Chrome Fire Extinguisher stands, fire extinguisher cabinets, ID signs, tamper seals and many more items.